Looking for deals in Prague? The Unitas Hotel enjoys a quiet location in a former convent, 800 ft from Charles Bridge. The staff was incredibly nice and professional. Rooms were awesome and comfortable. Set within 2 neighboring historic buildings next to the Charles Bridge, Hotel Pod Věží is in Prague's Lesser Town. Rooms are non-smoking and have free Wi-Fi access and coffee/tea making facilities. Staff were very friendly. They have great answers to all my questions. Location is perfect. An impressive Art-Déco building in the center of Prague, the Imperial Hotel is decorated with precious mosaics and historic hand-painted tiles throughout its elegant interior. Excellent location. Excellent facilities. Excellent staff. In a 19th-century building in the heritage-protected area, Boutique Hotel Seven Days is 215 yards from Prague National Museum. The staff was very friendly and helpful. Built in 2013, located in the center of Prague, within 11 minutes’ walk to the Old Town Square, the Charles Bridge or the Wenceslas Square, INNSIDE by Meliá Prague Old Town includes an à-la-carte... This hotel was the best in our honeymoon trip in Central Europe. The renovated Hotel Alwyn offers spacious and modern rooms with high-quality Hästens beds, LCD TVs and free Wi-Fi. The Old Town is reachable by foot and the Florenc metro station is 440 yards away. Staff was very professional. Nice room, good sound prof. This 4-star boutique hotel offers a central Prague location less than half a mile from the beautiful Old Town Square. Their friendliness and hospitality was amazing and exceptional. Renovated in 2015, Bishop's House is a design hotel in the heart of the historical center of Prague, only 197 feet from Charles Bridge and the Vltava river and a 10-minute walk from Prague Castle. No need to look at somewhere else in Prague. This is the best place to stay. Great value for money! The Clementin occupies a unique historic building in the heart of Prague, half-way between Charles Bridge and Old Town Square. Wi-Fi is available for free. Everyone there was very friendly and helpful, particularly Ramona who was great. Completely reconstructed in 2015, set in the historic center of Prague, Myo Hotel Mysterius is 656 feet from the Namesti Republiky Metro Station. The location of the hotel is on a quiet street, only few minutes walk from the old town square. Located 984 feet from the Old Town Square, Prague Life Masna offers self-catering apartments in central Prague. Free WiFi is available. The property is located very close to the heart of Old Town. Best location. The Grand Hotel Bohemia is located in the heart of Prague overlooking the red roofs of the Old Town, few steps from the Powder Gate and 656 feet from Namesti Republiky Metro Station and Palladium... I loved the hotel , absolutely beautiful The staff was amazing !! Aurus enjoys a fantastic location in the Old Town District of Prague, a 5-minute walk from the Old Town Square and the Charles Bridge. Great staff, awesome room, amazing location!! Which hotels in Prague are good for families? Many families visiting Prague loved staying at Golden Well, Hotel Residence Agnes, and Hotel Pod Věží. What are the best hotels in Prague near Charles Bridge? Some of the best hotels in Prague near Charles Bridge include Hotel Pod Věží, Art-Nouveau and Malostranská Residence. Which hotels in Prague are good for couples? These hotels in Prague are highly rated by couples: Hotel Pod Věží, Hotel Residence Agnes, and BoHo Prague Hotel. Which hotels are the best ones to stay at in Prague? Hotel Residence Agnes, Hotel Pod Věží, and BoHo Prague Hotel are some of the popular hotels in Prague. How much is a hotel in Prague for tonight? On average, it costs QAR 209 per night to book a 3-star hotel in Prague for tonight. You'll pay around QAR 306 if you choose to stay in a 4-star hotel tonight, while a 5-star hotel in Prague will cost around QAR 654, on average (based on Booking.com prices). How much is a hotel in Prague for this weekend? The average price per night for a 3-star hotel in Prague this weekend is QAR 483 or, for a 4-star hotel, QAR 766. Looking for something even fancier? 5-star hotels in Prague for this weekend cost around QAR 1,420 per night, on average (based on Booking.com prices). Which hotels in Prague have nice views? Archibald At the Charles Bridge, Golden Star, and Three Storks got great room view-related reviews from travelers in Prague. Which hotels in Prague offer an especially good breakfast? For hotels in Prague that serve highly-rated breakfasts, try Hotel Residence Agnes, INNSIDE by Meliá Prague Old Town (Formally Hotel UNIC Prague), and Hotel Pod Věží. How much does it cost to stay in a hotel in Prague? 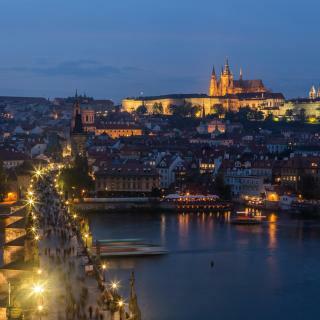 On average, 3-star hotels in Prague cost QAR 285 per night, and 4-star hotels in Prague are QAR 430 per night. If you're looking for something really special, a 5-star hotel in Prague can be found for QAR 707 per night, on average (based on Booking.com prices). Which neighborhood is the best one to stay at in Prague? Prague 01, Prague 02, and Prague 03 are popular with other travelers visiting Prague. What are the best hotels in Prague near Vaclav Havel Airport Prague? Travelers who stayed in Prague near Vaclav Havel Airport Prague (PRG) have said good things about Courtyard by Marriott Prague Airport, Holiday Inn Prague Airport, and Ramada Airport Hotel Prague. The Czech capital is nothing short of magical, with Prague’s countless bridges, cathedrals, domes and castles reflected in the Vltava River. Thankfully, the city escaped most of WWII’s destruction, leaving the rich history and fairytale facade of this Bohemian city intact. Prague Castle is the largest ancient castle complex in the world and the St. Vitus Cathedral is a stunning example of Gothic architecture. The Cathedral’s lookout tower rewards those willing to climb 300 steps with the best view of the city. Walking through the cobblestone streets of the Mala Strana district will bring you to the Charles Bridge. Prague’s beautiful 14th-century monument buzzes with musicians and local crafts sales. The Astronomical Clock, Tyn Church, and Storch building of Old Town compete for popularity with the neoclassical Estate Theatre and the Czech National Museum. The cafes and restaurants of Wenceslas Square are great for people watching and the Franz Kafka house, the Old New Synagogue and Frank Gehry’s Dancing House are perfect for soaking up history. Flights arriving at Vaclav Havel International Airport will be in the city center after a short subway ride. For historic hotels, cheap hostels or charming apartments head to Booking.com for nearly 700 accommodations in Prague. You have to see Prague and we can’t wait to go back. You have to see Prague and we can’t wait to go back. Everything is magical, interesting, delicious and unique. The prices for everything in Prague are so much more reasonable than much of Europe. Everything about the history, architecture, river, food, shopping will make you live Prague and want to return. Amazing place to spend your family holiday. Amazing place to spend your family holiday. Preserved historic atmosphere combined with modern city life. Walking distance to all touristic attractions, museums and popular places. Easy access to public transport which is recommended in the Old Town. Children playgrounds and parks clean and maintained. Lots of good restaurants with delicious food. Prague has everything that every member of your family desires. Fantastic city for walking around. Fantastic city for walking around. The Easter Markets were a great surprise. If you are a runner, go for a long run early in the morning to see the city with no people on the streets - it's beautiful! Great city to visit, something new around each corner, the old town was lovely, lots of places to eat with all different types of food, hiring bikes was great, the Easter market was on in a couple of locations and were really good for a wander round and more food! Plenty of souvenirs on offer too. The people were kind and helpful. The people were kind and helpful. The architecture in Prague is amazing. Nightime views of the city are fabulous. Food is good -- we opted for a variety of ethnic cuisines during our stay and we not disappointed. We learned more about Czech history. My favorite experience was a private local food tour- 420 773 700 585. Call him he was amazing. We dined and drank and learned a lot about the city as well. Also the Bohemian Adventures tour to Bohemian Saxon and Switzerland was awesome. The guides are informative and friendly. The scenery is incredible. This was my favorite activity of the whole vacation. First of all- the location. It’s less than 5 min walk from the Old Town Square. Our hotel “room” turned out to be an apartment (2 bedrooms, 2 bathrooms, living room and kitchen) and it was so spacious. A perfect heating system and easy to control. Every room had the perfect temperature. We had breakfast included and it’s served in another hotel, which is just next to it. The breakfast was super, with a great variety of foods. The staff is brilliant and they always try to be of help. Great location. Easy to get to Prague Center by public transport. Left our car at the hotel and took the bus across the street to tram and tram to either the side of Prague castle or the old town square. Bought a 3 day pass for public transport at the cost of 26 euros for 2 people (converted from CK). The breakfast was plentiful, the bed comfortable. We had a small room the first night but we were transferred to a bigger room for the next 3 nights (their offer). Great value for the price. One of the best hotels ,,walkable to the old town square and other attractions of the city , this hotel was just so perfect ! We were upgraded to an apartment on the sixth floor and what a beautiful apartment it was ! It’s an old family run hotel and it’s still got that old world charm to it ! The hotel provides free coffee and tea in the lobby 24hours , the breakfast spread was good too! I am looking forward to coming back here already ! The location was 1 1/2 blocks from the St Charles bridge and old town. The room was nicely unique with 12 foot ceilings and had a royal medieval feel to it and also felt like a luxury hotel with all the amenities. If you want a few days going back in time this is it. Breakfast had many diverse and very tasty offerings much to our delight. The staff was professional and courteous. The hotel is full of character. Loved the building and old style furnishings. Great location. A few minutes walk from the old town square. Staff very welcoming and friendly. Ate in the Deer restaurant one evening and food was delicious. It snowed the day we arrived which gave every place a magical look and you could get a real feel for Prague and it's culture and history. Everything! The rooms are so beautifully laid out, not like your usual hotel. Staff are amazing and so welcoming and helpful. Food is delicious, we had breakfast and dinner here. The location is brilliant, only a short walk to the old town square down a beautiful upmarket street. The wellness centre for us was the highlight, it is like a haven where you just forget the world. Moods is ideally placed, just a 5 minute walk to the Charles Bridge and the Old Town Square. The hotel itself is brand new and a fabulous place to stay with a superb breakfast and what must be the best employees in Prague! We thoroughly enjoyed our stay and certainly endorse Moods as a first rate hote. If you are looking for a hotel with best quality-price relation, this is your hotel. 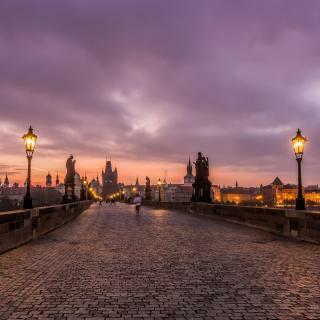 Staff was very helpful and kind, always willing to assist, the location is just perfect 5 minutes from Charles Bridge and another 5 from Old Town Square. Even breakfast is good. What else can we ask for? Everything about this hotel is perfectly fine. The rooms are clean and spacious, comfortable beds. The location is perfect right a few steps from the Old Town Square. The breakfast is also very good. I highly recommend this hotel to the visitors of Prague. The location - you are right in the middle of old town square. The view was amazing from our window. The bed was super comfy and everything was gorgeous in the hotel. Both their terrace and Black Angel's were fantastic! Friendly staff helped to arrange taxi to CK. Hotel room is simple but comfortable. Not super close to the old town square nor Charles bridge, around 10-15 minutes walk, but super close to louvre cafe. Breakfast is good and hotel people are helpful and friendly! Our room with balcony is excellent for relaxation. Good location near Old Town Square where all the activities were happening there!!! The excellent efficient staff. The cleanliness of the hotel , and also the central location . Just 5 min walk from the old town square. Hotel is in close proximity to historic old town square. Friendly service at reception.